Home » Food n Beverage » purchase » spend » Celebrate Pasta Month with Barilla Contest: Win Glasslock Tempered Glass Food Container set worth RM239! 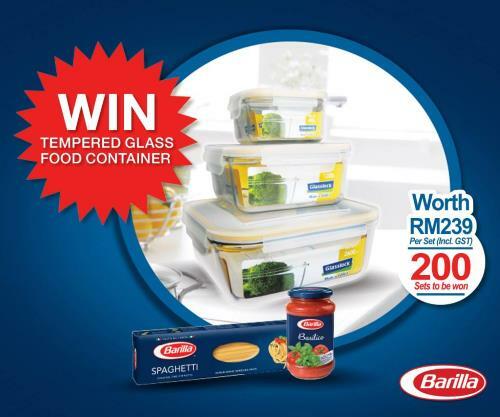 Celebrate Pasta Month with Barilla Contest: Win Glasslock Tempered Glass Food Container set worth RM239! Buy RM10 (inc. GST) and above worth of any Barilla (pasta and/or sauces) products in a single receipt as proof of purchase. Answer the questions in the contest form. Visit Barilla Pasta Month Contest terms & conditions for more details.